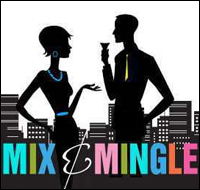 Mix ‘N’ Mingle will be held in the Mayfield Village Civic Center on Wednesday, October 2nd from 11:00 AM – 2:00 PM and brings together single people, married couples, men or women age 60+ to mix and mingle with each other while enjoying good conversation, laughter, and refreshments! $3.00 per person, payable at the door. Registration is required by September 25th by calling (216) 650-4029.